One thing I really miss about living on my own is having my own kitchen. I think I got spoiled with knowing it was always clean, where everything was, and having a fridge with ONLY my food, instead of 4-5 other people’s. 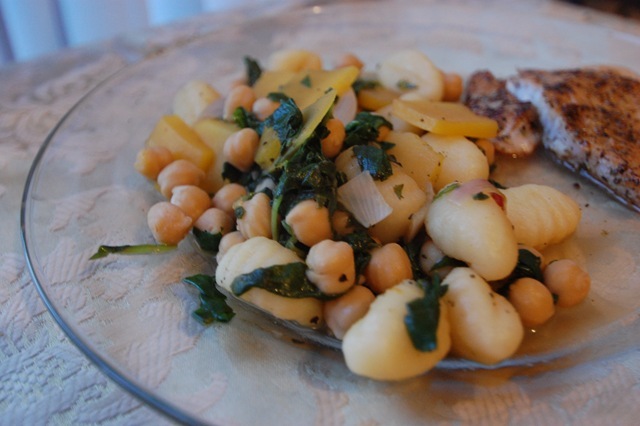 I found a recipe for Chickpea, Spinach & Squash Gnocchi from eatingwell.com and decided to give it a try. I made a few modifications, like leaving out currants. 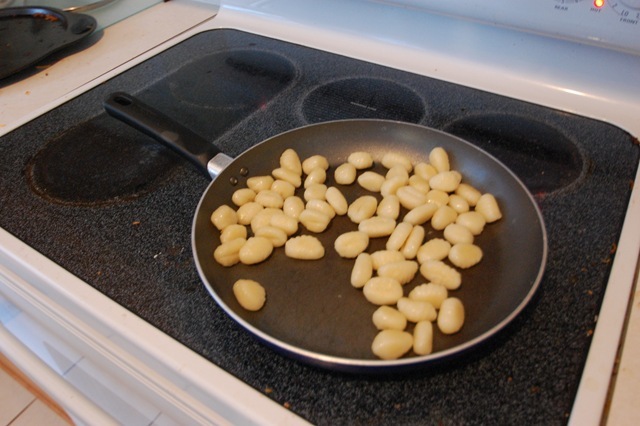 The first step was to boil the gnocchi. I brought water to a boil, plopped them in, and waited until they floated to the top which took about 3 minutes. I drained them, and added them to a skillet to brown. 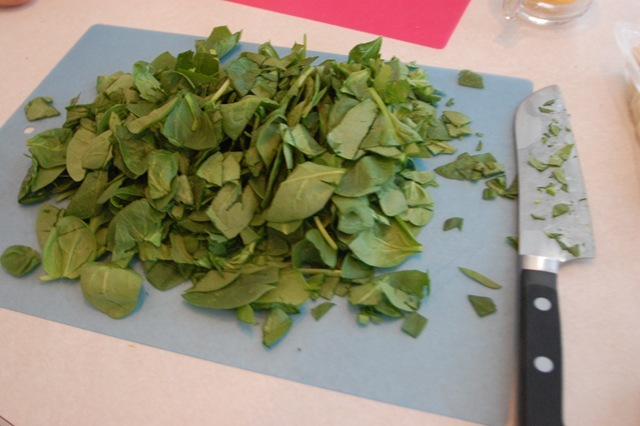 Meanwhile, I chopped up an entire bag of baby spinach (8 cups) into smaller pieces. 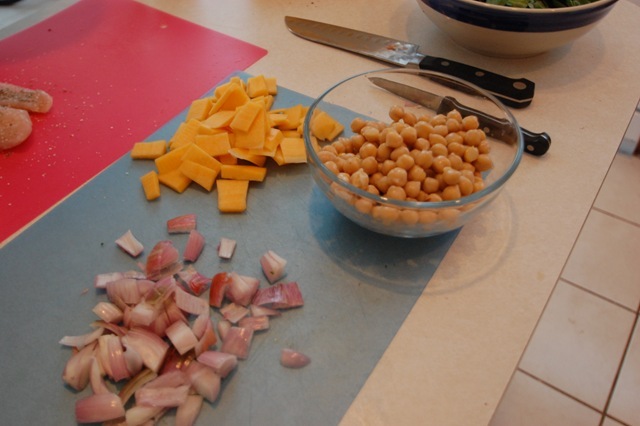 I also chopped up two (2) cups of butternut squash, two (2) shallots, and drained one-15oz can of chickpeas. Once the gnocchi was done browning, I transferred it to another bowl. 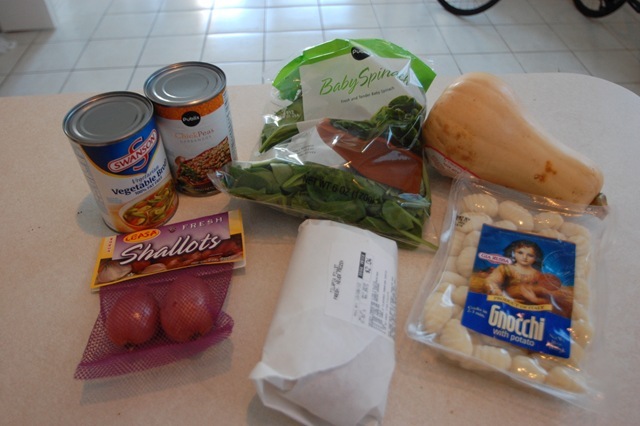 I added in a spoonful of minced garlic, olive oil, butternut squash, and the shallots. 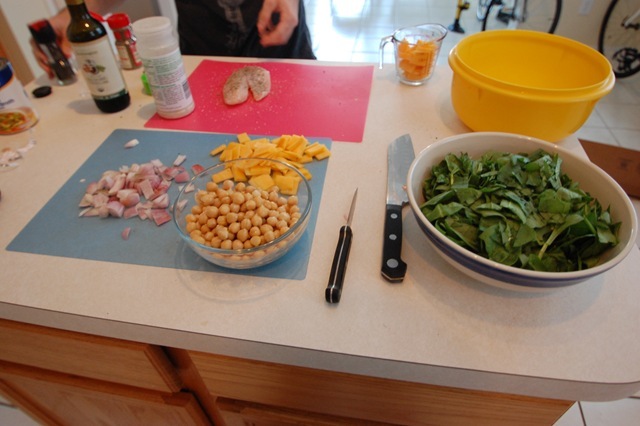 After a few minutes, I added a 15-oz can of veggie broth, the spinach, chickpeas, and gnocchi. While it was cooking, I sprinkled in some sage, salt, and pepper. The sage really made the kitchen smell amazing! The recipe called for balsamic reduction to be drizzled over top of the finished product, but it was still cooking when the reduction was ready. 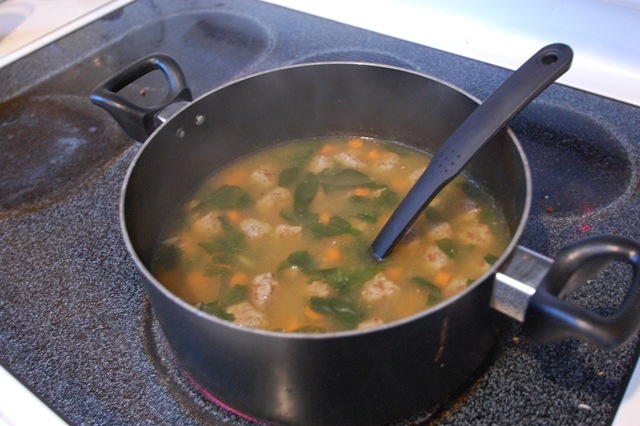 I went ahead and stirred it into the pot, which made the flavors really mesh together. Wow! This was seriously delicious. 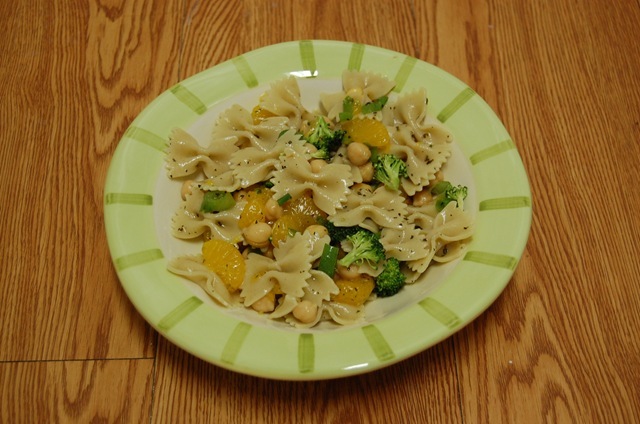 The combination of the sage, butternut squash, and balsamic went very well together. The smell filled up the kitchen and made it feel like winter time. 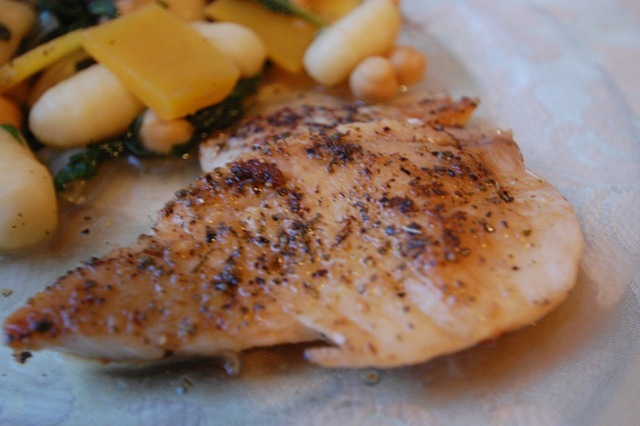 Mark cooked a piece of tilapia for us to share as well. He covered it in sage, salt, pepper, and balsamic vinegar before searing it in the pan. It went so well with the gnocchi salad! This meal was an interesting challenge. I was in the mood to cook a delicious meal (with company) but it ended up costing more than was really in the budget. I got to thinking, at what point does the cost matter enough to sacrifice doing what makes you happy? 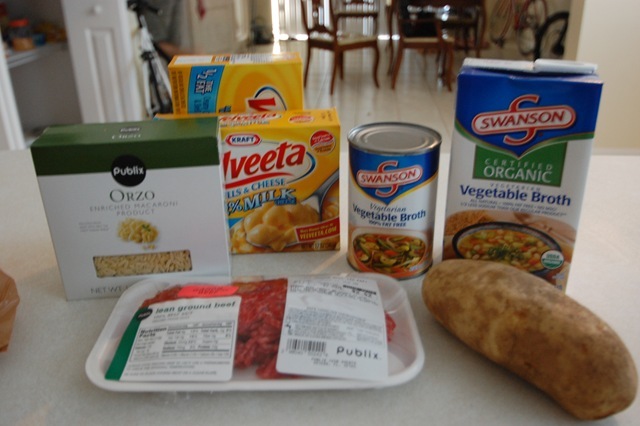 Sure, we could have eaten a box of macaroni and cheese for $0.83 and saved a ton of money. My stomach would have been satisfied (as in, not hungry) but I wouldn’t have been able to enjoy the pleasure of trying a new recipe, experimenting with new foods, or having a fun night with Mark! Even though $16.00 for a 4-serving meal isn’t outrageous, it still isn’t cheap. Interesting thing to think about. Is cooking important to you? Is it something that brings joy to your life, or simply something that you find a necessary part of life? Where do you draw the line in terms of budget vs. taste buds? 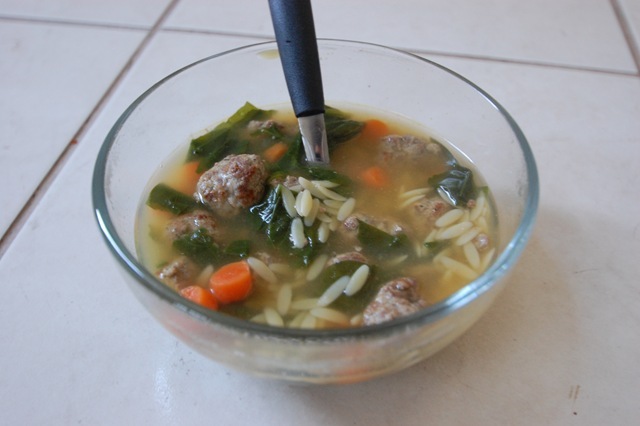 Tonight’s Dinner Creation: Italian Wedding Soup! I found myself with some spare time this weekend, and decided to try a new recipe. 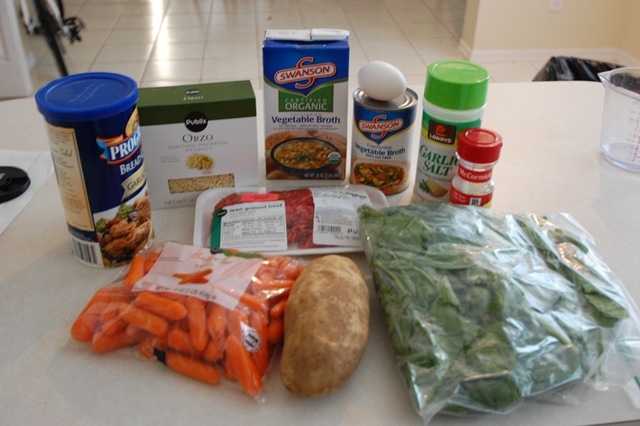 I had to make a quick grocery trip to buy a few items, which I was sure to work into the Grocery budget challenge. I chipped in $5.00 for our meal (Mark and I split the bill), bringing my October Grocery Bill Total to $40.50. I pay for all my own food separately anyways, so the challenge works out. A great money-saving tip I learned was to ask the grocer to break packages for you. 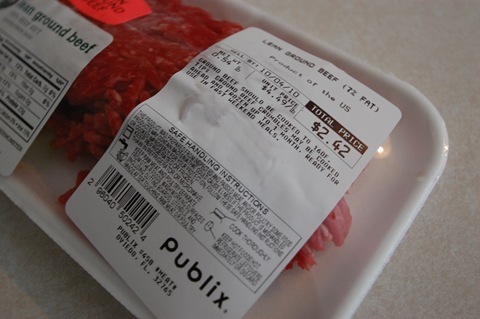 My Publix packages Lean ground beef standard in 1.3 lb average sized packages, which cost about $6. I only needed a half pound, and probably won’t be using the rest before it goes bad. I asked him to break it up for me, and he did with no problem! 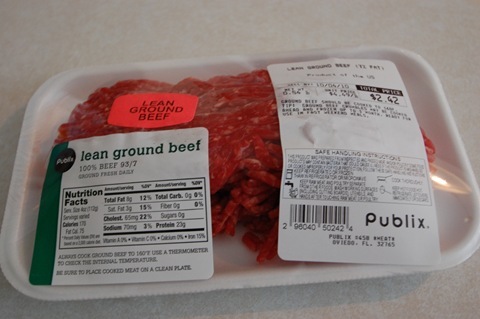 Instead of paying $6, and wondering what I could do with the rest of the meat, I paid less than $2.50! Amazing! 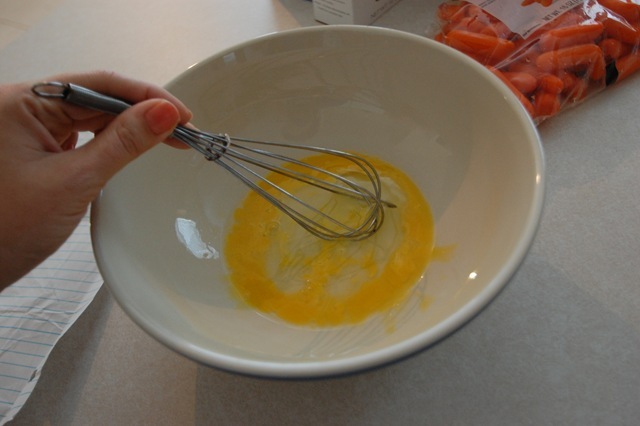 First, I lightly beat an egg in a medium mixing bowl. 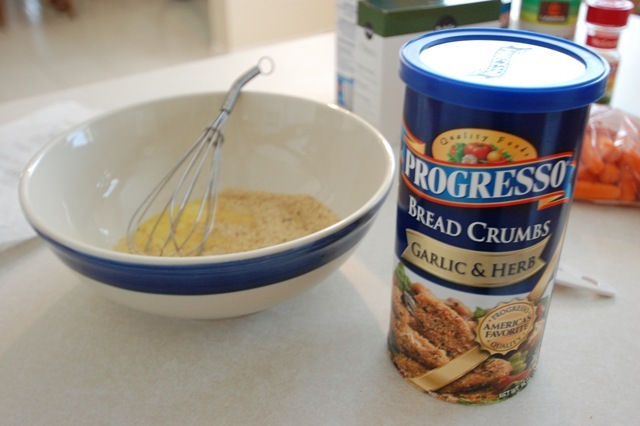 I then added about 2 Tablespoons of Italian bread crumbs, a dash of garlic salt, and some pepper. 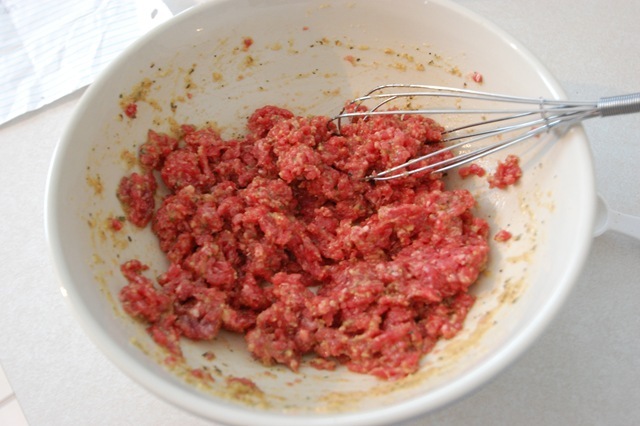 I then mixed in the meat until it was all covered in herbs. 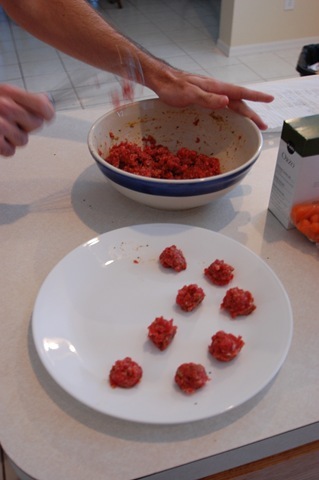 Mark used a teaspoon to scoop out mini-meatballs. Meanwhile, I boiled nearly 6 cups of vegetable broth. I suppose chicken broth would have worked, but Mark and I both prefer vegetable broth based soups. 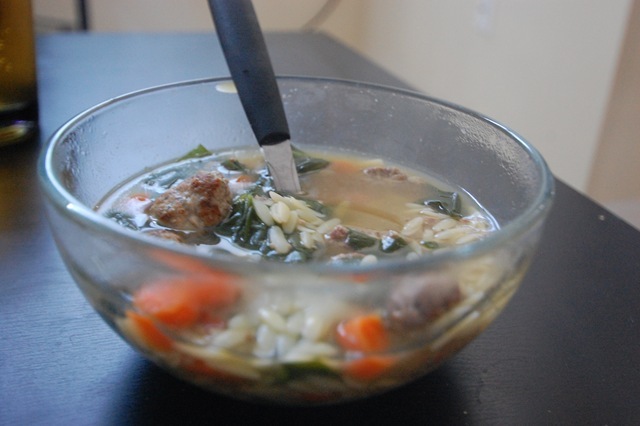 Once the broth began to boil, I dumped in three (3) cups of spinach, chopped carrots, and one (1) cup of Orzo pasta. 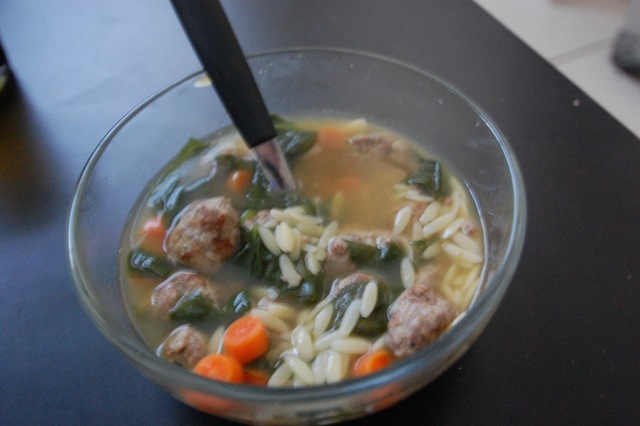 Mark browned the meatballs in a frying pan before adding them to our soup. We let it all boil for ten minutes, long enough for the orzo pasta to completely cook. After it simmered, we served, and enjoyed! This puts the canned stuff to shame! 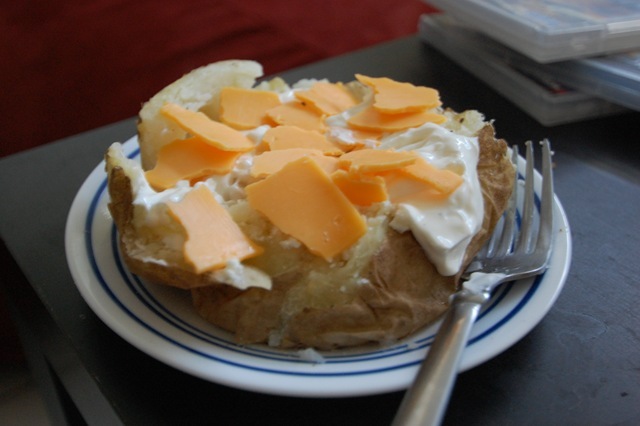 The recipe made about four (4) bowls worth of soup, but Mark managed to eat three of them and a baked potato. Somehow he remains thin and doesn’t go broke feeding himself. Oh, boys. Off to a wedding in Italy! I mean… to bed. Goodnight! I started reading the first chapter, and so far it is absolutely amazing. I am so proud of my friend for her accomplishments, and for continuing to inspire others. I can’t wait to read more! 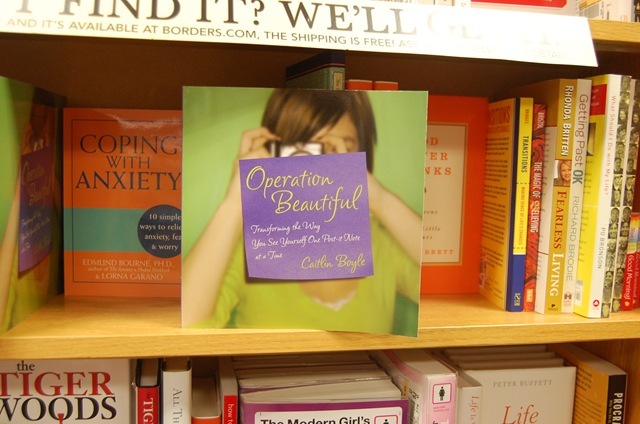 The book officially comes out on August 3, but for some reason I was able to find it early at Borders. On Friday morning, I treated myself to a new kind of breakfast. I was out of fresh fruit (only frozen) and decided to try something new. On top, I added some Kashi Crisp cereal. Light, refreshing, cold, and crunchy. What could possibly be a better summer combination? 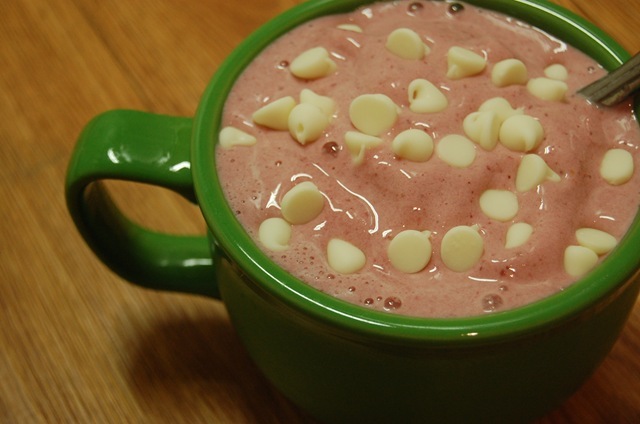 I loved it so much, that I tried another version of the smoothie for dessert last night: with white chocolate chips! It was an extremely healthy ice-cream treat alternative. 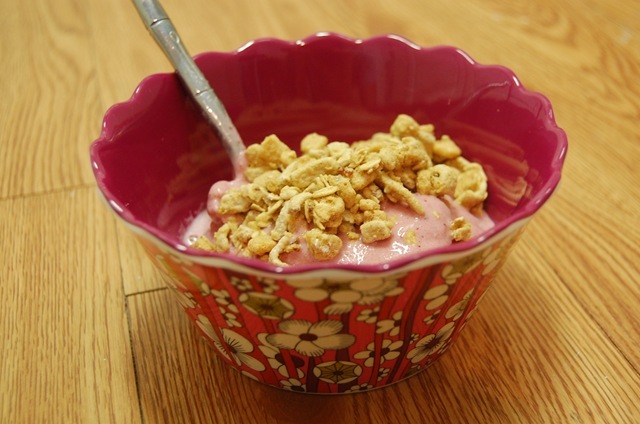 Have you tried a smoothie in a bowl? What would be your choice of toppings? With my air conditioning broken, heading to work at my warehouse job (also with no air conditioning) cold food was needed to keep my cool!! 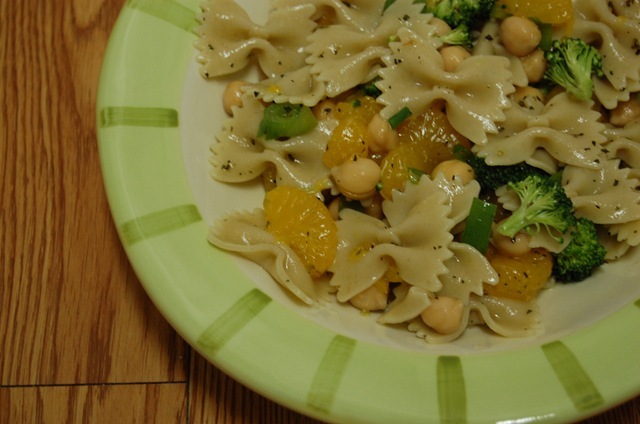 Luckily on Sunday I made a delicious pasta salad with plenty of leftovers. It was easy to grab and go on Monday! 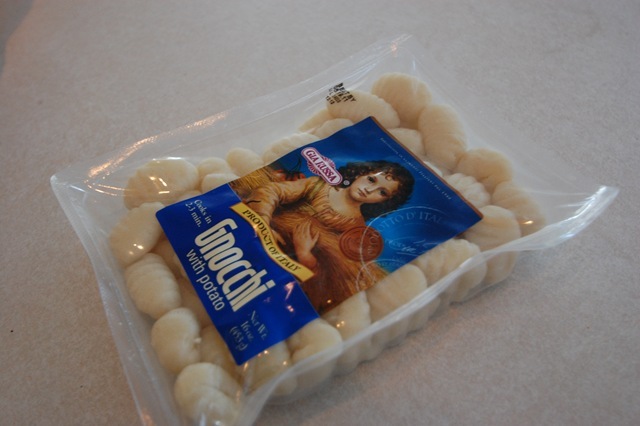 I was craving fruit and pasta at the same time… random, I know. I decided to add fruit to my pasta! 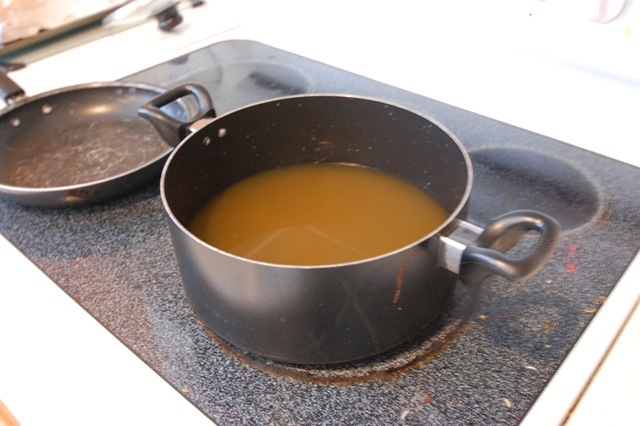 Boil half a box of bowtie shaped pasta, drain, and allow it to cool in the fridge when it’s done cooking. 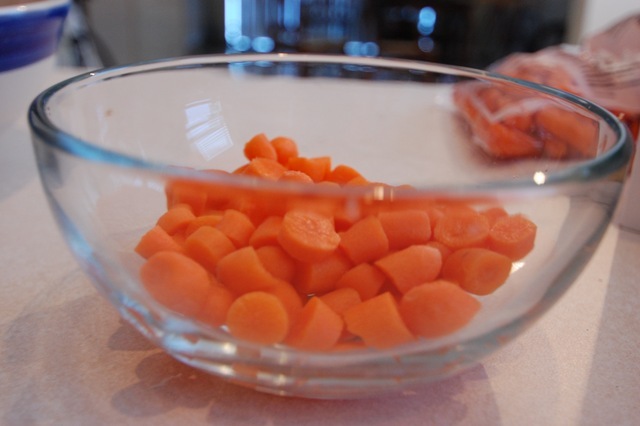 Drain and rinse a 15 ounce can of garbanzo beans and an 11 ounce can of mandarin oranges. 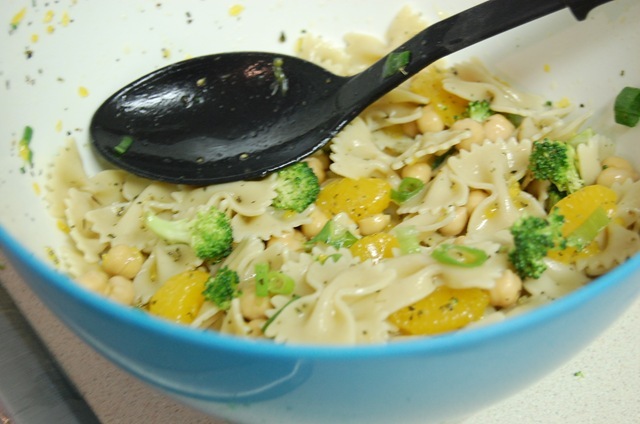 Add the beans and oranges to the pasta, along with green onion and broccoli. 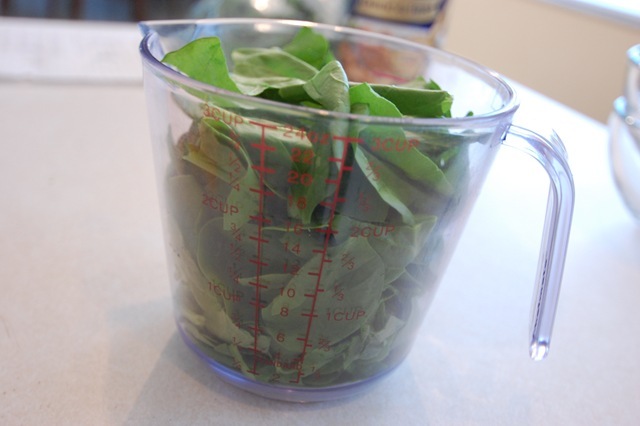 For the dressing, combine in a shaker: 1/2 cup orange juice, 1/2 cup white vinegar, 1 TBL olive oil, salt, pepper, oregano, and basil. Mix it all together, and refrigerate. Enjoy! It was light and refreshing. I think it would have been even better with a little bit of red pepper added to the mix. Who knew that all of this running and biking could be so incredibly unglamorous!? This morning, Caitlin asked me to go on a bike ride with her. I knew I wouldn’t be able to bike for a few days due to a crazy schedule so I happily agreed. It was a great ride! 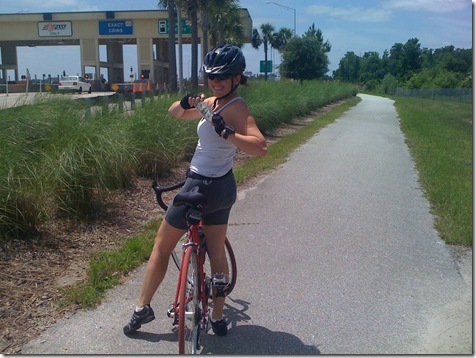 I ended up riding 25.0 miles (I only planned on 10-15) in 1 hour, 52 minutes. We chatted about Caitlin’s upcoming 100 mile bike race and I am so excited for her! It was a fun ride, and I even found a dollar bill on the side of the road! Dolla Dolla Bill, yo! Apparently in the past few weeks, it became summer in Florida. I didn’t pack enough water and I had to borrow some of Caitlin’s. I came home and was pretty much STARVING! 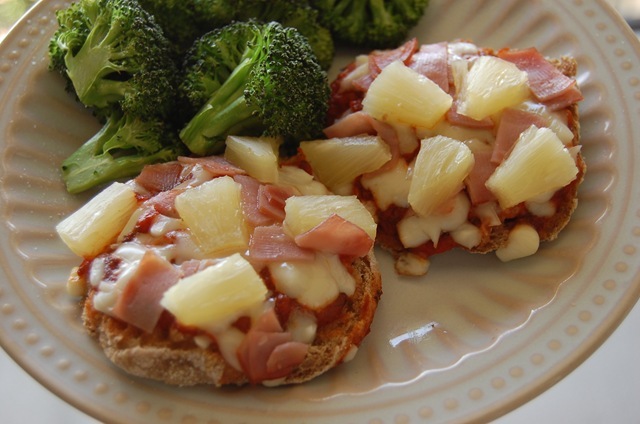 It was well passed my normal lunch time, so I whipped up a quick Hawaiian Muffin Pizza. I baked it for 10 minutes at 350F. So good! I also roasted some broccoli on the side. OMG! 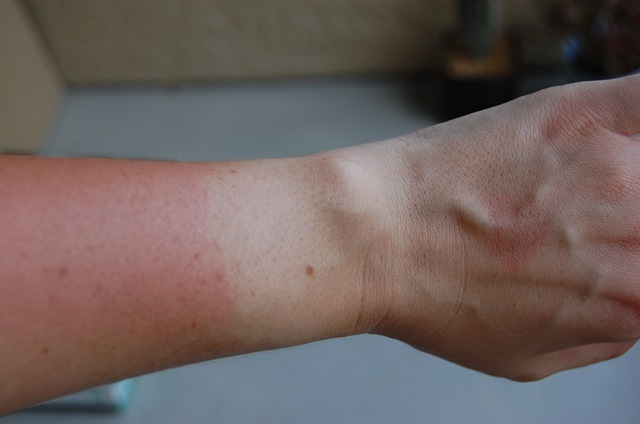 I am SO sunburnt! I started panicking! SKIN CANCER! SKIN CANCER! 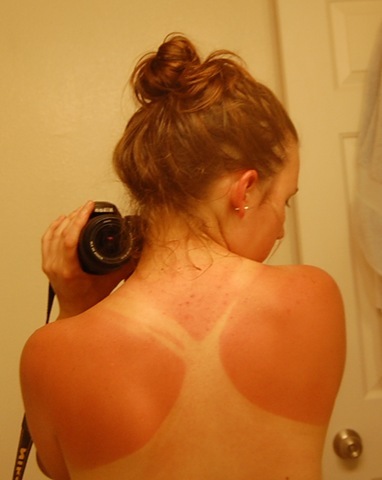 I ran to the bathroom and checked out my back, which was also exposed to the sun. Uh-Oh. I am officially a lobster. 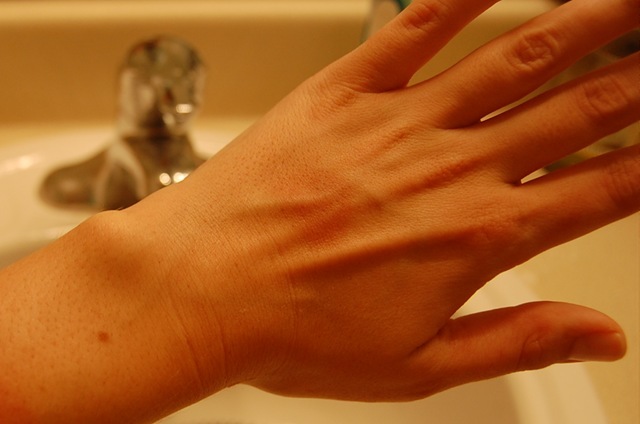 I can’t believe that in two hours I managed to get so red! This is bad news. I have a wedding to attend tomorrow night, and I’m wearing a strapless dress! I always think of all the GOOD things that running and biking do for my body. A strong heart, strong legs, strong lungs, stress relief, and pure joy of exercise. Today, I thought of all of the UNGLAMOUROUS things that they have done for me. I have permanently tattooed bike chain greased leg. 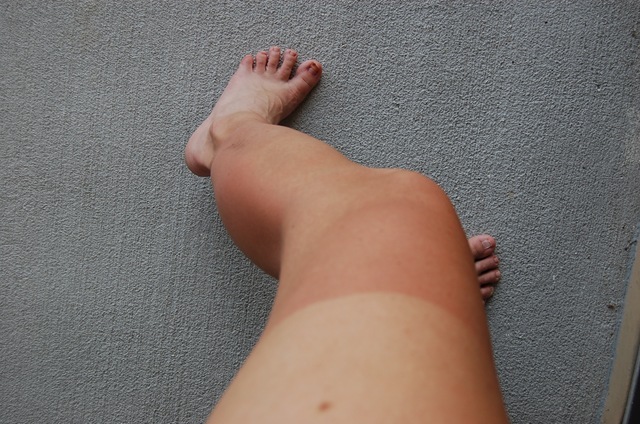 …and now, a sunburned back. Le sigh. I really don’t know what to do about this. YIKES! 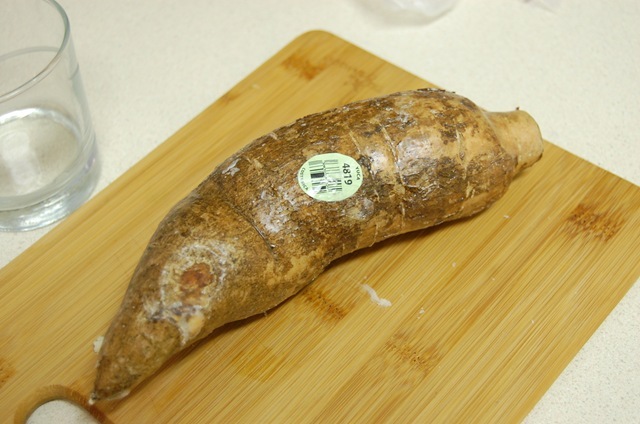 I finally found a yucca root at my grocery store! Ok, that’s a lie. I actually went to a different Publix so that I could find this. I don’t know why my usual one doesn’t carry it!? 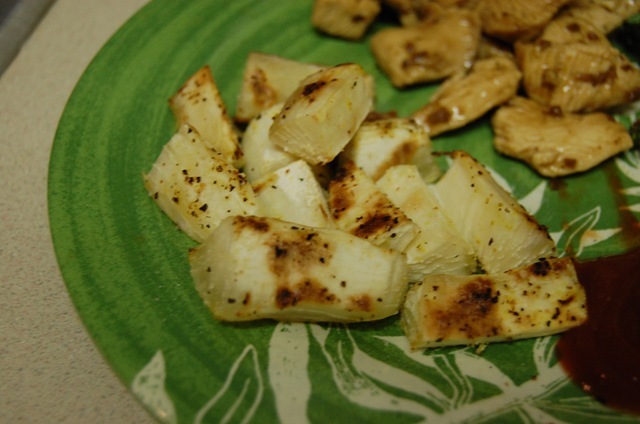 I have been wanting to make yucca fries ever since I started seeing them on the blog world. My yucca was small, so I had to make yucca tots. 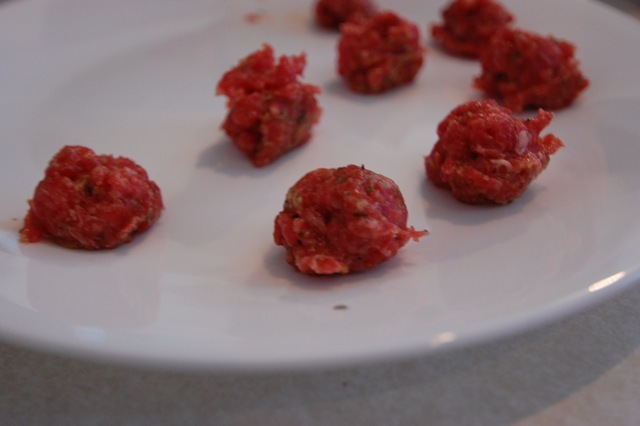 They were pretty easy to make, and tasted great! 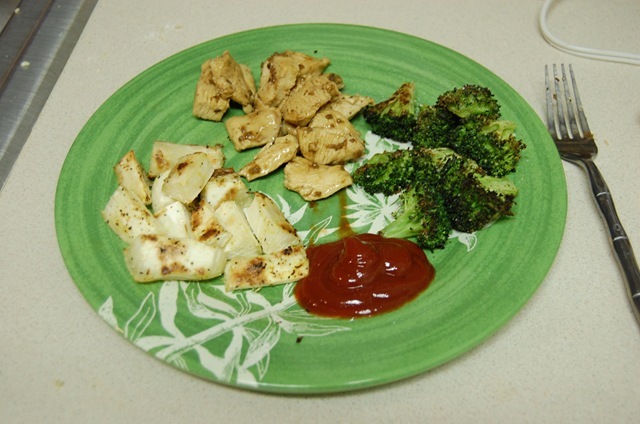 Mark made some chicken with balsamic and onion, plus roasted broccoli to go along with it. 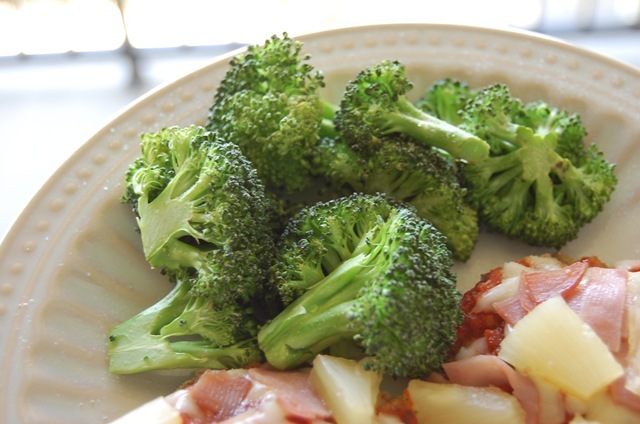 I think roasting broccoli tastes much better than steaming it, but I’m usually too lazy to do it! Four weeks ago, I announced that today I would be running Miles for Moffit 5k. I decided not to participate in the race for a number of reasons. Ever since I got home from a action-packed weekend in North Carolina, I have worked three full days at both jobs (8am-8pm) and another day (only until 4pm) followed by a bike ride. I have not been getting adequate sleep and I woke up on Friday feeling absolutely drained. I had trouble getting out of bed, and when I finally did I just felt achy all over. I knew that I could not PR as I’m just coming back from a knee injury. I planned on racing just “for fun” but the thought of waking up, driving 1.5 hours away to race alone, and dropping $25 (plus gas) didn’t really seem all that fun. Sleep sounded MUCH better. I fell asleep on the couch last night at approximately 8:38 pm. The boyfriend and I had just turned on a movie and I crashed. I woke up 12 hours later feeling completely re-energized. Clearly, my body needed sleep much more than it needed a race. It kind of stinks that there really aren’t any more running races until August, but I’m okay with that. I have PLENTY of time to prepare for them, and it’s too hot in summer anyways. Instead, I’m off to bike with Caitlin! Then, I’m heading to Tampa to see my family. Have you ever bailed on a race? One of the things that I hate about working out after work is that I get done and I’m starving. Working out during dinner time makes for a very hungry girl! It helps to think of what I want to eat either before or while I’m exercising so that I can immediately start making it when I return home. Last night, I met Kelly for a 14.0 mile bike ride. We started a bit late, and ended up chatting some afterwards. I didn’t get back to my apartment until after 8:00 pm. 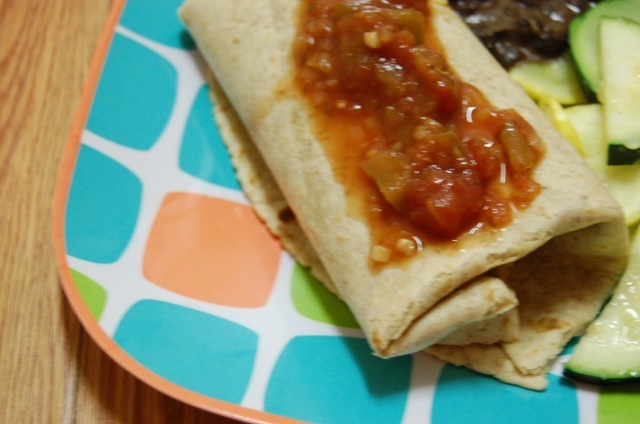 I love Amy’s frozen burritos, but they are pricey! This was an inexpensive and tasty option. 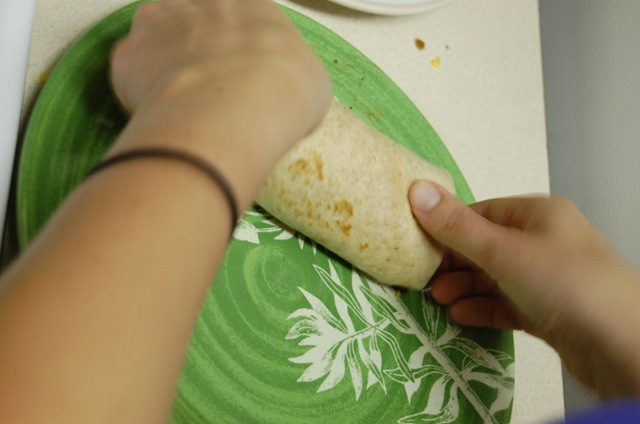 It was easier than I thought it would be to make my own burrito. My mom made black beans while I was in NC and she sent me home with a couple of frozen bags worth. 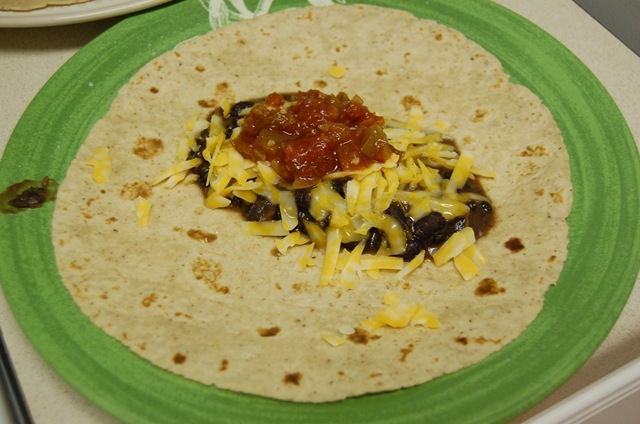 I took a whole wheat tortilla and added shredded cheese, mom’s black beans, and salsa. 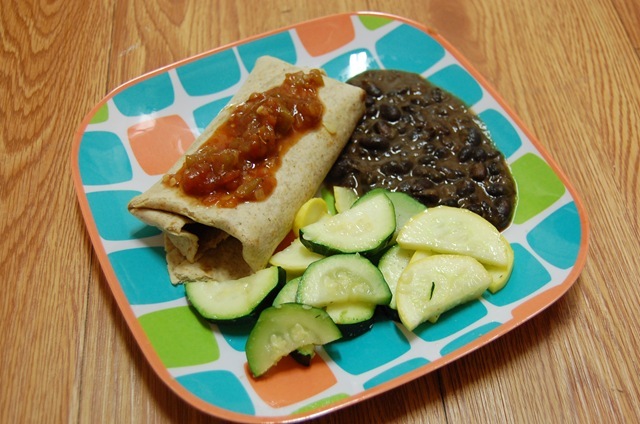 If I would have had some leftover rice, guacamole, or green peppers that would have been good as well. 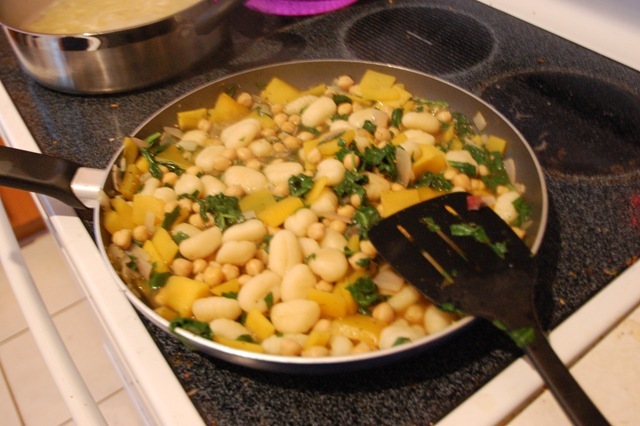 It was kind of small, so I had some extra beans on the side along with leftover steamed squash. The whole thing took under 10 minutes from start to clean up. 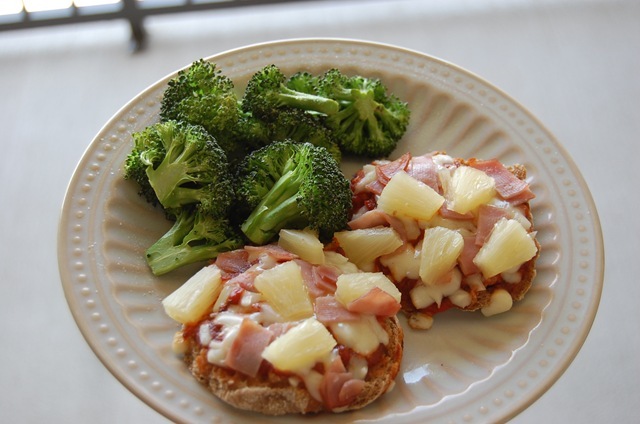 I am obsessed with quick meals. Pretty much everything I make these days is fast. 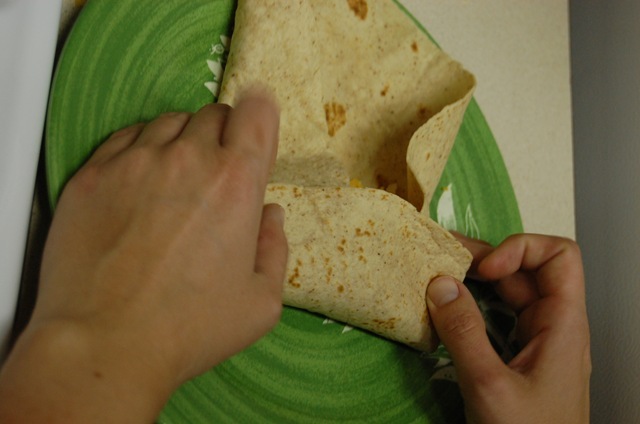 What are your favorite things to put in a burrito? I am open to pretty much everything, but I absolutely HATE sour cream.